The review of available data, concerning to large sized hominoids of the Himalayas is presented. They are mainly footprints and a remote observation. It is shown, that these data reveal the basic prominent features of the primates, and allow to describe them as a separate species. One of the features is unusual four-toed foot. A taxonomic name for this hominoid -- Homo pardigitatus sp. nov. ("having pairs of toes") is proposed. -- Is it possible that some creatures, strikingly similar to us, really live now on the Earth? -- Why we know about them much less, than about other inhabitants of the Earth? -- If they do live beside us, how and why they can disappear from our attention, and how such populations can biologically exist? Those, who are familiar with history of discoveries of the apes and with quests for hominoids, not included in scientific taxonomy, can see the analogy between searches of zoologists of 100-200 years ago and the situation in modern hominoid researches. For instance, one may compare monstrous images of gorillas in those not so old days and those received during modern observations. Then, during researches of gorillas, thousands of them were killed in the name of science, their skulls, skeletons, and skins in hundreds were put to museums. This approach is impossible for hominoids. There is no the basic element of zoological taxonomy -- holotype that would be in an accessible museum. And, perhaps, never be. Hominoids will not be exposed in zoos. So, the only possible approach, seen now, is categorization of available, so frequently sketchy, information about hominoids. In this article the available data on large primate of Himalayas are collected and reviewed. 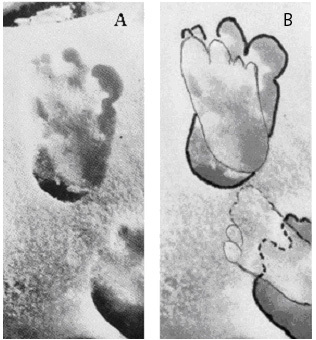 European public had shown some interest to mysterious hominoids soon after 1951, when English mountain climbers Eric Shipton and Michael Ward had photographed unusual footprints on snowfields at high mountains in the Himalayas. The tracks were clear and sharp, and it was possible to measure their size. The prints obviously belonged to a large being -- 13 inches (33 cm) long and 8 inches (20 cm) wide. It was obvious that the creature walked on two legs, like human. No animals known to the climbers could make such tracks. "It was on one of the glaciers of the Menlung basin, at a height of about 19,000 feet, that, late one afternoon, we came across those curious footprints in the snow…. We did not follow them further than was convenient, a mile or so, for we were carrying heavy loads at the time, and besides we had reached a particularly interesting stage in the exploration of the basin. I have in the past found many sets of these curious footprints and have tried to follow them, but have always lost them on the moraine or rocks at the side of the glacier. These particular ones seemed to be very fresh, probably not more than 24 hours old. When Murray and Bourdillon followed us a few days later the tracks had been almost obliterated by melting. Sen Tensing had no doubt whatever that the creatures (for there had been at least two) that had made the tracks were "Yetis" or wild men". Fig. 1. Tracks in Shipton's photo: A -- original image, B -- the same with contours that show prints of each creature. These prints have not been unequivocally explained within more than fifty years. At first it was supposed, that the tracks had been made by a large creature, that moved at this point alone. The general contour of the footstep was unusual. 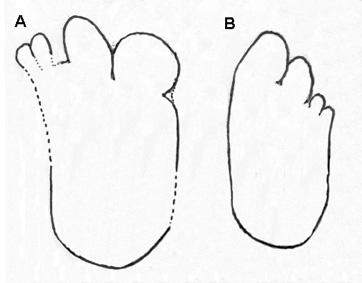 Figure 1A shows it was concave on the side of reduced toes. It seems that small toes are on the inner part of the foot and strong toes are on external. But this assumption contradicts to all available data on feet of primates. Other hypotheses were discussed, among them that the track is superposition with print of a large predator ― leopard (Napier 1972). They are also not convincing. The author (Trachtengerts 2003) has shown that those tracks are superposition of tracks by two individuals of same kind. Structure of feet that appears from the photo shot is unusual for both -- human and anthropoids. They are tetradactyl with two large strong toes on inner side and two smaller reduced ones on external side of foot. It is clear with contours of overlapping prints, that foot of each creature has own individual features. Figure 1B shows that the bigger creature walked first followed by the smaller one. Foot length of the first one (33 cm) helps to estimate his height as about 215-220 cm, according to humanlike proportions for relation of foot length to height that is near to 15-16%. The second one, that had foot 28 cm long, may be nearby 185 cm high. The hominoids walked with small distances between prints. Obviously, they moved there with care, probably, the place at glacier was dangerous for them. 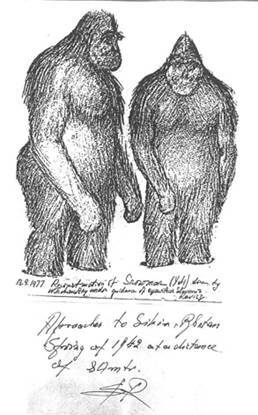 For many years among researchers of Himalayan hominoids dominated opinion that the photos by E.Shipton were unique, that nobody else met tracks of similar creatures. Some opinions were expressed that the prints were faked. However, the specified features of feet of same kind were found among images in reports of other expeditions. This dismisses accusations of possible faking from Eric Shipton. 2.2 The tracks met by Pierre Bordet. The French geologist abbot Pierre Bordet in the early fifties participated in two travels to mountain Makalu. After return he published (Bordet 1955) four photos, which were not correctly used by researches for careful analysis during the following years. Fig. 2. The first tracks shot by Pierre Bordet in May 1955 in valley of Barun: A -- full shot, B -- zoomed image of the two first prints. They show bare feet tracks in snow of unusual form. In the report Bordet pointed out on some features that are common with those photographed by Shipton, namely -- they are similarly big, number of toes in both cases is four, instead of five. P.Bordet put special attention to the last feature. Now we are convinced once again that he was right. Bordet came upon these tracks by chance. He had no intention to look for the Yeti at all. The second track on Bordet's shots in Figure 3 shows clearly enough two overlapping prints, and the upper one completely corresponds with that in shot by Shipton. It is made by right foot of a creature and has four toes. Two of them are large and two are small. The right part of the contour is hidden under lumps of snow, which have fallen off on track. It is interesting to note -- pairs of the big and small toes are separated, and a small wall of snow appeared between them. Hominoids walked one after another, putting feet in same places in snow, as well as in Shipton's case. C -- contours of overlapped tracks (Trachtengerts 2004). 2.3 Observation by Anthony Woodridge. In 1986 journal Cryptozoology published the story by physicist and mountaineer A.Woodridge about his encountering with Yeti (Woodridge 1986). The alleged meeting had occurred in March of the same year. At that time A.Woodridge was in Indian part of the Western Himalayas with a charitable mission. He wished to attract attention of possible sponsors to his mission and from time to time carried out actions of sport kind. In March from 2 till 10 he made an alone run in upper parts of a valley. On March 6 Woodridge had reached snowfields at heights 2800 meters and followed farther. Snow was seen around untouched since last snowfall. To his surprise, at height of 3300 meters he had found out track of prints. The snow-covered slope was overgrown with rare bushes. Wooldridge made only two pictures of tracks: a line and a single track. The track was still fresh and distinct, the length of it was 10 inches (appr. 25 cm). It is a bit smaller than the Shipton's tracks. The feature marked above on P.Bordet's tracks (short snow wall between pairs of toes) is well notable on Figure 4B. A.Woodridge continued his run up in mountains and soon he saw what he thought was a standing motionless Yeti. He photographed it from far distance and the founding later was declared in the title of his article. Next years the place was examined by other researches. They found out that it was an edge of a rock, not a living being. But the photos of tracks in snow made by A.Woodridge are of scientific value. They point out areal of these hominoids. It may be concluded now that form of footprints of large Himalayan hominoids is clear enough. It based mainly on photo by E.Shipton and M.Ward, because other shots, so clear, were made aside from vertical and presented somewhat distorted shapes. The contours of footprints for both exemplars are shown in Figure 5. Fig. 5. Contours of footprints made by two exemplars, received from Shipton & Ward photo. A -- the print of the larger one. The supposed lines of the print in those parts, where it was overlapped by the other, is executed by a dashed line. B -- the footprint of the smaller one. Both prints have in general similar form and, most probably, belong to a same species. They have four toes, two of which are large and strong, and two are reduced small at external side of the foot. They differ in form of print of first toes (thumbs?). It may be assumed, that the thumb in the print of first exemplar bent and pushed in snow dipper as a hook. One can see in Figure 1 that shadow in its depression wider than in toe print beside. The second creature put its foot on firm snow of previous print, and it had no need to use toes in such a way. The feet of such hominoids may be up to 35 cm long or more. There is one well described observation of the large Himalayan hominoids. It written in documentary book by Slavomir Rawicz (Rawicz 1956). He tells in it about own experience in 1942 during runaway from a Siberian labor camp with a group of prisoners. They walked southward and overcome wide spaces of Mongolia, West China, Tibet, and the Himalayas in their way to India. They were doing nothing but moving around slowly together, occasionally stopping to look around them like people admiring a view. Their heads turned towards us now and again but their interest in us seemed to be of the slightest. I looked back and the pair was standing still, arms swinging slightly as though listening intently." "But I insist that recent estimations of growth of these beings in 5 foots (150 cm) are erroneous. The minimum growth of the adult of a being should be an eye-lo of 7 foots (210 cm)"
Rawicz then was not familiar with latter observations of smaller Himalayan hominoids to whom estimations in five foots are concerned. In 1977 anthropologist W.Tschernezky and S.Rawicz fulfilled picture of the creatures that Rawicz saw in the Himalayas (Tschernezky and Rawicz 1977). It is necessary to note, that in Rawicz's observation and, in particular, in the picture, there are some details that prove validity of his report. In 1940-th when the encountering occurred, no agitation yet was around existence of Yeti. S.Ravich and its companions knew nothing about these beings of the Himalayas, neither they knew legends and real stories from locals. So they did not fear the creatures, as the natives do. Therefore they did not run from them in panic, but quiet and with attention examined them within two hours. Such duration, apparently, is the record in Yeti observations in history of the Himalayas. The drawing made after Rawicz's encountering once again confirms the fact that images present much more information about living creatures than verbal descriptions, that allow different interpretations. In this drawing we see form of head narrowed up that is missed in Rawicz's text, but mentioned by other observers. It allows to suppose, that the skull of these hominoids has some kind of sagittal crest. On front part one see massive prognathic jaws. As a whole, the form and position of body of these hominoids is much closer to human, than it is shown in various reconstructions made upon verbal data. The large stomach points out that the vegetal food is main part in their diet. The developed massive buttocks, that were not mentioned by Rawicz, show that the creatures are completely biped (Short 2000), and also, perhaps, their ability to overcome hungry periods. This feature to accumulate fat in buttocks for hungry periods is present in some human races that live in hard environment. Rawicz's comments on hominoid movement over dangerous snowy edge of a cliff show remarkable coincidence with a chain of tracks in Shipton's shot. In both cases the creatures walked with care by small steps, carefully checking way with feet. In both cases there were couples of bigger and smaller beings. We may suppose that these Himalayan hominoids live as families consisting of couples. W.Tschernezky talked to three other runaway mates that had confirmed this story. Bobbie Short had some meetings with Slavomir Rawicz and also felt confidence in it. At the end of the survey, it may be concluded with high probability, that tracks, found out by Shipton and Ward, Bordet, and some other researchers, are made by creatures of the same kind, as Slavomir Rawicz saw, and they are real beings. After such conclusion the problem arises to appoint a taxonomic position to this kind of creatures. In spite of the fact, that existence of large Himalayan primate was discussed by both -- general public and some professional anthropologists, no proposals for scientific name for it are known. Wladimir Tschernezky in the hominoid reconstruction (Tschernezky 1959) tended to connect these creatures with fossil hominids and, in particular, with Paranthropus crassidens, that had sagittal crest. I do not know, whether he offered other names for these hominoids after he got acquainted with S.Rawicz. With the data on body appearance, bipedality and form of feet, the described primate preliminary can be a species of genus Homo. Tracks of not less than five individuals show, that characteristics of feet, number and structure of toes are not result of traumas or other external reasons. They are inherent features of these primates. Consequently, I suggest to insert the peculiar feature of the toes in its species name -- pardigitatus, that means "having paired toes" in Latin. Exactly, having two pairs of toes -- one pair of large toes and one pair of small toes in each foot. 3.2. The description of species Homo pardigitatus sp. nov.
Holotype. The bigger from the two primates, represented in drawing by S.Rawicz and W.Tschernezky. The drawing was made in September 13, 1977, based on impression obtained during encountering with the creatures in February 1942 while tracking the Himalayas near Sikkim. Presumably, it is a male. The age is not known. The characteristic. A large biped primate about 240 cm high. The position at movement -- vertical, legs are straight. All body, except face, palms of hands and feet, is covered by hair. There are two types of hair on the body: red-brown rather short hair that covers body densely, and more long and rare grayish hair that passes through dense hair and hangs downwards. The body is massive, wide and powerful. The head is large and narrowed to parietal part. The narrowed part is from forehead to back of the head. There are thick brow ridges. The forehead is rather high and not too sloping. Face bones are developed. The nose resembles a small human one. Jaws are very large and prognathic. The neck is powerful. Shoulders are wide and fall from neck to arms. The stomach is big. Buttocks are considerable. The upper limbs are long, they can reach knees. Feet have in general proportions close to those of human but they are larger and considerably wider. Feet have four toes. The first from inner side of foot and the second, close to it, are large and well developed. The others two at outer sides of feet are rather small and undeveloped. Behavior. There are no enough data about life of these Himalayan primates. Their tracks met seldom, mainly in snowfields of high mountains. Probably, they inhabit lower parts on the mountains and move across snowfields from one valley to another. Tracks and some observations show that they often associate together in couples. On dangerous sites of mountains they move slowly with careful probing the way by feet. According to found tracks the area of Homo pardigitatus is the Himalayas and Karakoram. Paratype. The lower object in drawing by S.Rawicz and W.Tschernezky. Apparently, it is a female. She is about 210 cm high. Her age is unknown. I thank Bobbie Short and Lorenzo Rossi for help to receive some relevant publications. Bordet, P. 1955. Tracees de yeti dana l'Himalaya. Bulletin du Museum d'Histoire Naturelle de Paris, ser 2, 27, number 6. Napier, J. 1972. Bigfoot: The Yeti and Sasquatch in Myth and Reality, Jonathan Cape, London. Rawicz, S. 1956. The Long Walk: A Gamble for Life, Harper & Brothers, New York. Shipton, E. 1952. Mount Everest Reconnaissance Expedition 1951, Hodder & Stoughton, London. Ward, M. 1997. Everest 1951: the footprints attributed to the Yeti -- myth and reality. Wilderness and Environmental Medicine, 8: 29-32. Wooldridge, A. B. 1986. First Photos of the Yeti: An encounter in North India. Cryptozoology, 5: 63-76. Trachtengerts, M. S. 2004. Tracks of four-toed Himalayan hominoids. Natural and Technical Sciences (Estestvennye i Tekhnicheskie Nauki), 1:84-89, in Russian. Иззард, Р. 1959. По следам снежного человека, Географгиз, Москва.